In traditional Aboriginal society, women travelled with canine companions draped around their waists like garments of clothing. Dingoes played an important role in the protection and mobility of the women and children, and are believed to have greatly extended women's contribution to the traditional economy and food supply. Cohabitation with human society represented a transient phase of the dingo's lifecycle: the pups generally returned to the wild once mature (at one or two years of age) to breed. As such, dingoes maintained the dual roles of human companion and top-order predator – retaining their independent and essentially wild nature over thousands of years. The dingo's ability to locate water above and below ground was perhaps its most indispensable skill. Written records, artworks and photographs in museum archives reveal dingo water knowledge as recorded by European explorers. Records reveal a number of accounts of wild/semi-wild dingoes leading Europeans to lifesaving water springs. In Australian cartography, a "Dingo Soak" refers to a waterhole dug by a mythical or live canine. There are other freshwater landmarks across the continent – "Dingo Springs", "Dingo Rock", "Dingo Gap". One file contains a curious letter, offering a home to one of the dingo pups on display, dated May 14 1908. The request for the pup was signed by Theodore Roosevelt junior. At the time, Theodore's father was in office as the 26th president of the United States, and the Roosevelt family were in residence at the White House. The Roosevelt children were well known for their eclectic pet collection. Many arrived as diplomatic gifts and ended up at the National Zoo, or were traded through the local Schmid's Bird and Pet Animal Emporium at 712 12th Street NW. The list included snakes (which ended up, uninvited, in the Oval Office) and a pig, smuggled into the presidential residence under the care of a young Quentin Roosevelt. The pig, once discovered, ended up in Schmid's Emporium for sale under a sign stating: "this pig slept last night in the White House". 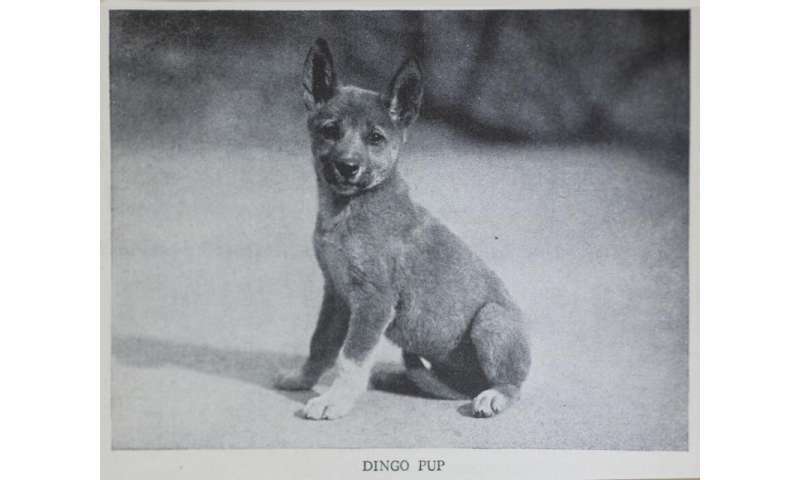 No records have surfaced about the Roosevelts' dingo. However, five months later – around the time that the pup would have been challenging all boundaries of domestication – a sale notice appeared in The Washington Post, dated October 16 1908, under: DOGS, PETS, ETC. "JUST RECEIVED, Dingo, Australian wild dog … SCHMID'S BIRD STORE 712 12TH." "This dog, who was female, was about eighteen months when she arrived in Europe. She lived in freedom in the vessel where she was embarked, and despite the corrections inflicted on her, as well as a young male that died as a result of a punishment too harsh, she continued to evade punishment and consume all that suited her appetite." Eventually the bodies of both were transferred to the stores of the Muséum national d'Histoire naturelle and preserved for perpetuity. Notes in the museum state that early on in the voyage of Le Naturalist, before departing King Island for France, the male dingo had "been too brutally castrated because of his independent character" and these injuries eventually killed him. In 2006, a team of NASA scientists from the Smithsonian's Centre for Earth and Planetary Studies were in Australia's Simpson Desert studying the formation of parallel desert dunes similar to those found on Mars. Another reference to a dingo appears in the Smithsonian records in 2014, this time as the NASA Curiosity Rover crossed the Martian landscape. The vehicle passed an ancient dried freshwater lake on Mars, before travelling up through "Dingo Gap" in the sand dunes.